I'm a musician. I've been playing bass since middle school. Before I was a musician, I was a sound engineer. All things electronic interest me, and the place with the most electronics in my childhood church was the sound booth. Most churches aren't exactly overflowing with volunteers to work a mixer, so I found my enthusiasm and curiosity rewarded with opportunity. I learned how to balance a gain stage versus a fader. I learned how to tweak EQ to make thing sound better. I learned to anticipate cues. That means I often found myself as the bass player AND the sound engineer for most bands I played with. As I matured, I stopped bands and stuck mainly to playing at churches. There is generally a volunteer or three in charge of the technical production in a larger church, so I found that I was able to just be a bass player. It was nice. But, I also noticed that volunteer turnover is a reality. It takes years to produce a sound engineer who is knowledgeable and experienced enough to contribute to audio production in a way that is musical. You need a person who is equal parts artist and engineer. Those people are rare. When you have one, any sound system is transformed into a member of the band. Every note you play sounds sweeter, and the monitors are as clear as a mountain stream. Word travels fast when one of these audio mages enters a community and every organization with a set of faders begins to court them. Churches, local theaters, studios and even local bands beg for their time and talent. There are not enough of them to go around. We make do with what we have. Ah, but there are computers now. In the home studio, levels of sound production are possible today that are astounding. Products like Garage Band take arcane knowledge and expensive hardware and replace it with algorithms and clever interfaces. Suddenly a passionate amateur can produce a serviceable recording, and someone who really puts in time and effort may produce a work that deceives the casually listener that it was produced in a "real" studio. It has been clear to me for sometime that this technology would make it to the world of live sound. Now it has. Enter the Line 6 StageScape M20d. It was announced at NAMM, and I've anxiously awaited a review from the field. None ever came so I decided to bite the bullet and grab one for my church youth group. Little did I know I was ordering it in its first week of availability, and that the review I'm writing now may be one of the earliest on the web. My hope is these words can help someone who is considering this product to make a decision. Let's start with why I was so interested. On Sunday mornings we have good sound. We're in a large sanctuary with reasonably good mains. There is a nice, large format Allen & Heath console. Many channels are run through rack-based compressors. The musicians have in-ear monitors. There are dedicated people for sound, lights and lyrics each week. On Wednesday nights, we aren't so lucky. We use an aging Mackie mixer with no effects connected to big & loud speakers. Sometimes we can talk our upstairs sound people into visiting, but mostly we have kind-hearted high school students running the mix. The results should be familiar to anyone. The bass frequencies are muddied, resonate and flabby. Everything is muffled because any attempt to bring back high EQ produces squealing feedback. Often students complain that they can't hear the vocals–you know it's bad if teenagers think it's too loud. When the youth pastor stands to speak, the headset mic is either overdriven and distorted, of we get feedback every time he has the audacity to take a step or turn his head. Right now, someone is reading this and nodding their head. Now, I can sit at the console and fix all of this. I can't get the sound I want without compression, but I can at least make it serviceable. The thing is, I've been running sound for longer than these students have been alive. In some cases, I've been doing this double their years on this earth. I can't play bass and run sound though. It was time for something better. The StageScape M20d interested me for a lot of reasons. First, setup is simple and automated. The mixer inputs are intelligent-and there are a good number. You have 12 XLR inputs with preamps and 4 line inputs. There is also a mini-jack input for laptops, iPods and the like. When you plug something in, a new input appears on the touch screen. You then select a preset via icons representing different input types, and move the icon to where it appears on your stage. Again, this is done via a touch screen–there are no complex menus. It took me less than 30 minutes to configure a stage environment for our setup. I suspect I could to it in less than 5 now. The "stage." Tapping an instrument selects it. When you select these presets, the mixer automatically assigns a signal chain with processing appropriate for the inputer. This will be come combination of an input, compressor, noise gate, EQs, limiters and effects. It's all integrated. There's no rack, and no miles of spaghetti cabling. Of course, a complex signal chain can produce great sound, but it adds complexity. Line 6 has really covered new ground here. If you select an instrument and press the Tweak button, you get a novel XY interface with plain English terms like "Bright", "Full", "Open", or "Controlled." dragging a finger across this controller adjusts whatever values in the signal chain are required to produce that result. Even for someone with the knowledge to do it manually, the speed and ease is impressive. I use the "Quick" mode to get an initial sound before diving into the "Deep" mode where all the controls accessible in dedicated hardware lie. I purchased the optional WiFi adapter. This means iPads can connect to the mixer and control it. During practice, we adjusted our monitors from the platform without the need to shout at a sound person. The StageScape M20d supports up to 4 discrete monitor mixes. That also means we can use the 20 second recording function, and then step out into the audience and mix our own sound. Let me say that again. With the StageScape M20d you can be your own sound engineer, and know exactly what the audience will hear. We recorded 20 seconds of a chorus and then sat down where the audience would be and started playback. You can hear the effects of channel tweaks and the mix as if you were still playing. You can mute or solo individual instruments. Once this is done, you have something special. You have a professional sound. Suddenly the vocals are clear and present. The guitar is full without being grating. The keys are clear without dominating. The bass and kick are powerful, chest-thumpping and defined. What was a mess of resonate bass frequencies and feedback is now something else: music. And here is where it all comes together. Pressing the "Perform" button puts the mixer into performance mode. To train someone how to run sound you tell them to touch the picture on screen to select an instrument and then turn the brightest knob to change the volume. They can also press the speaker icon to mute an instrument. That's it. Anyone with a good ear can mix now. Instead of an intimidating expanse of knobs and faders they are presented with an iPad like touch screen and simple, color coded controls. There's no way around it, the StageScape M20d is a revolution in sound. At $2,499 the StageScape M20d is not inexpensive. However, if you were to build a competitive platform out of traditional hardware it would cost more. Every channel can be equipped with a professional signal chain. Did I mention the master bus has a multi-band compressor and limiter? For churches, bands, theaters and other organizations that need quality sound but don't have a sound genius, I recommend this mixer. 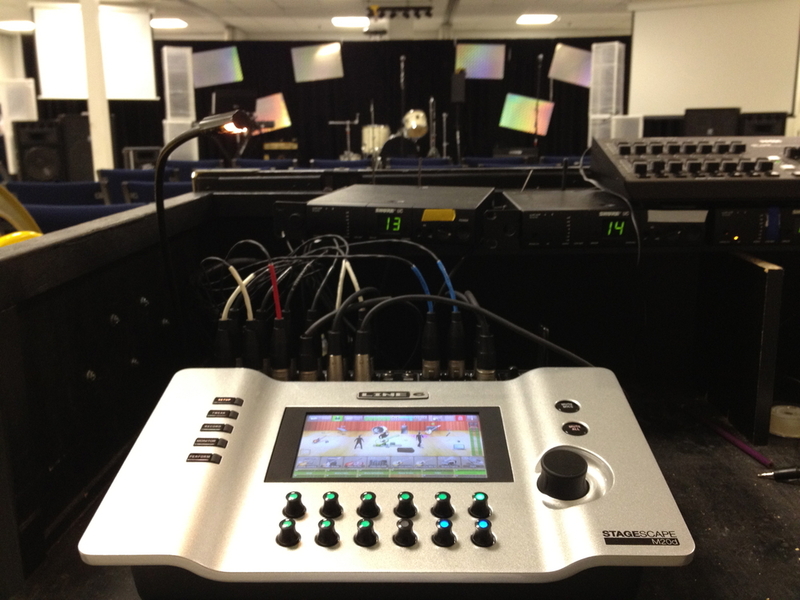 I've never seen an easier way to quickly setup and configure a great live sound experience.